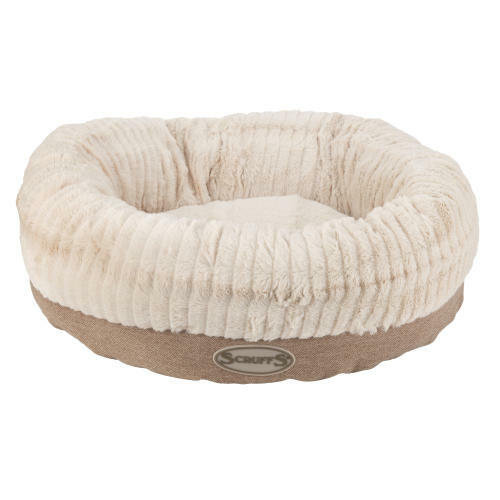 The Scruffs Ellen Donut Dog Bed in Tan is a highly luxurious bed that's been lined with plush faux fur for optimal warmth and comfort - great for drifting away the day and relaxing in! The Scruffs Ellen donut bed is filled with 100% recycled green fibre filling, combined with a fixed centre cushion for improved support. The mattress is made using an integral 100% recycled green fibre filling, secured in four places, this provides greater cushioning characteristics and enhanced durability. Features a non-slip base and the complete bed is machine washable at 30 degrees.